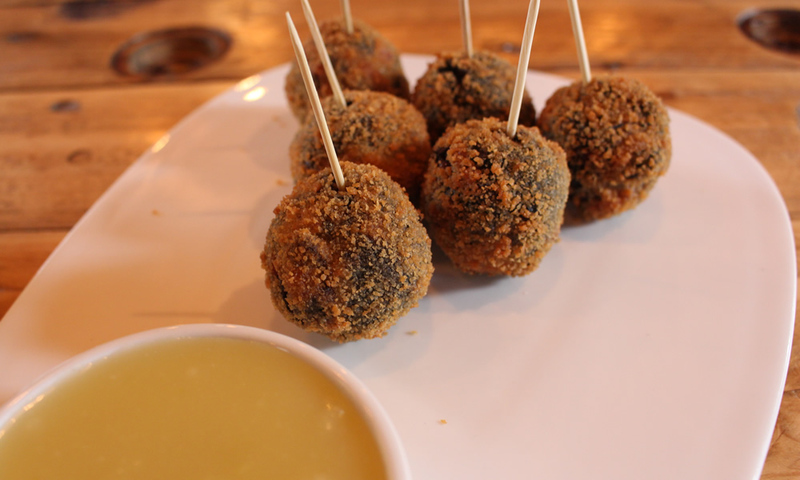 It seems that most gastro pubs have had a black pudding bon bon on their menu at one point or another over the last year, they seem to be all the rage these days. Usually they’re an compliment with a piece of duck or pork and sometimes they’re the highlight of the dish. So having said that it’s time for me to get on the black pudding bon bon band wagon. My recipe adds bacon to the mix and is served with a sweet apple and cider sauce. Slice the black pudding into 1cm thick disks (if not already) and add to a pan of boiling water. Simmer for 6 minutes and drain in a colander and leave to cool. Grill the rashers of bacon until cooked but not crispy. Chop finely into approx. 4mm squares and add them to a big mixing bowl. When the black pudding has cooled, remove the outer skin if there is any and add to the mixing bowl with the bacon. Using your hands (wet them first to stop the mixture from sticking) give the bacon and black pudding a good mix and shape into balls about 20-25g each. Once all the mixture has been used you can leave the balls in the fridge while you make the apple and cider sauce. Peel and core the apple and roughly chop into thumb size pieces. Add to a pan over a medium heat along with the sugar and a glug of cider (I used a sweet cloudy cider). Simmer until the apple is well cooked and falling apart. Leave to cool and using a hand blender whizz until smooth. You can add a little more cider if the sauce is too thick. Half an hour before you are ready to serve take the bon bons out of the fridge letting them come to room temperature. In one bowl add the eggs and whisk. In another bowl and the breadcrumbs and season with a little salt and pepper. Take each ball and roll in the egg mix and then the breadcrumbs until well coated. Once all the balls are coated set oil in a deep fat fryer (or a deep wok) to 180°C. Once up to temperature deep fry in batches. Drain the excess oil off on kitchen roll and keep walm in tin foil until all the bon bons are cooked. Warm the apple cider sauce and serve.